If you want to repair the cracks on your home’s walls or foundations, there are two different crack injection techniques available to you: high-pressure and low-pressure injection. Both techniques used by Foundation Crack Expert Group enable the quick and long-lasting repair of your foundations. High-pressure injection involves inserting a liquid into a very narrow crack (less than 1/32″ or 0.75 cm) at very high pressure. The required equipment was specially designed by a highly qualified technician to infiltrate any type of cracks with a 100% efficiency rate. The technician’s work involves regulating the flow, as well as the pressure of the liquid in the concrete crack for a lasting final result. In the residential sector, the resistance of concrete on a wall or foundation floor is approximately 20-25 MPa or 2900-3625 psi. In the event that the pressure is unable to reach a minimum of 2500 psi or exceed 3500 psi, you would get poor quality work and assured inefficiency. 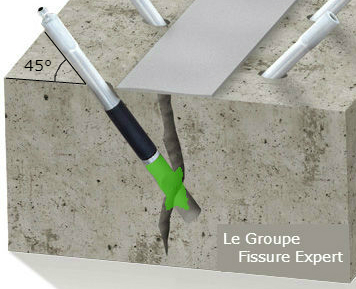 It is important to remember that too much flow and too much pressure will create micro-cracks in the concrete and around the injection port, where the liquid will escape instead of infiltrating the crack. The following photo clearly illustrates the crack injection method. It is demonstrated by installing metal mechanical injection ports at a 45-degree angle to the crack. This technique aims to insert the polyurethane injection from the middle of the crack. This gives us the assurance that the crack will be infiltrated to its end points and from one side to the other. The low-pressure injection method involves inserting a liquid at a very low pressure into a narrow crack (more than 1/16″ or 1.5 mm). This type of injection requires some basic equipment: a caulking gun, a dual-cartridge gun or a hand-held sprayer. However, the crack injection technique requires some practice for the repair to be effective. Low-pressure injection uses the gravity principle rather than the pressure principle itself, since the pressure used is around 50 psi. This technique is mainly appropriate in the case of epoxy injection for non-active cracks, inherent to structures that must retain their architectural features: parking slabs, viaduct pillars, lamppost bases, etc. 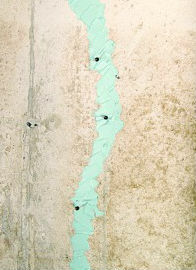 The method is not very suitable for repairing cracks on a concrete foundation wall. The crack must have an opening greater than 1/16″ or 1.5 mm. Otherwise, it will be impossible to inject a sealing liquid into the narrowest part of the crack. Generally, this is the area where water gets in. There must be no water infiltration during the work. The following photos clearly illustrate the injection method. It is demonstrated by the installation of plastic injection ports, placed directly on the crack. Choosing between high-pressure injection or low-pressure injection depends on the type of crack you are dealing with. Consider having your cracked foundation inspected so that a professional can determine the type of injection to use. Having the cracks repaired in your building helps prevent water infiltration. Do you need an experienced technician for high or low-pressure injection into your foundation? Contact one of our technicians in Quebec for your crack repairs.